Taking turns at the controls of Solar Impulse 2 (Si2) – their zero-emission electric and solar airplane, capable of flying day and night without fuel – Bertrand Piccard and André Borschberg succeeded in their crazy dream of achieving the first ever Round-The-World Solar Flight. By landing back in Abu Dhabi travelling 43,041 km in a 17-leg journey, Si2 has proven that clean technologies can achieve the impossible. 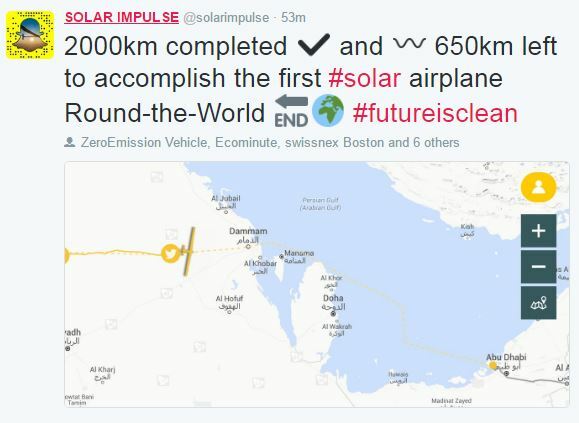 Beyond this historic milestone, the two Swiss pioneers will continue to urge the global implementation of energy efficient solutions through the creation of the International Committee for Clean Technologies and leverage the expertise and technology gained over the years in Solar Impulse by launching new innovative projects, such as the development of solar powered drones. 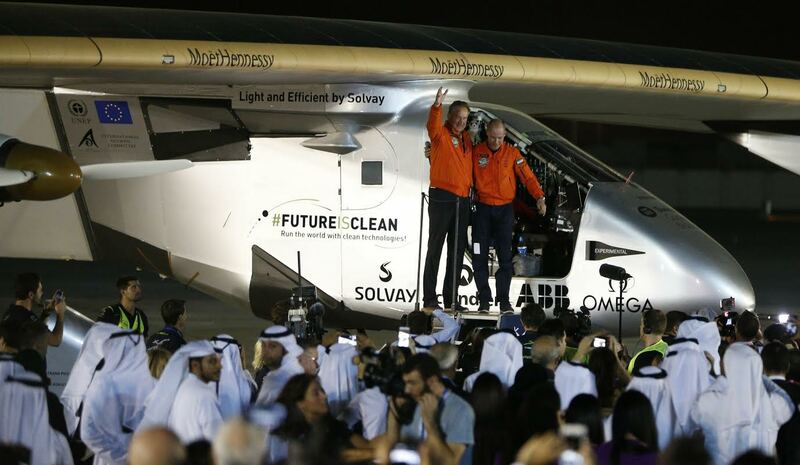 Coming from Egypt, Bertrand Piccard landed in Abu Dhabi (Tuesday, July 26, 2016) this morning at 4.05 am local time completing the final leg of an endeavour that was until now considered impossible: flying around the globe in an electric airplane powered only by the Sun and capable of flying many days and nights in a row without fuel. 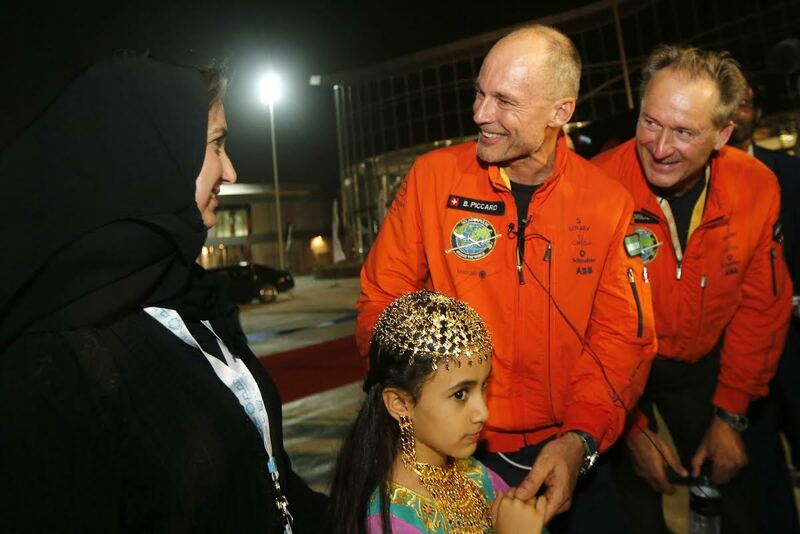 This landing brings full circle the historic circumnavigation that began on March 9, 2015 when Si2 set off from Abu Dhabi with André Borschberg at the controls. A total of 19 world records were set or are still pending by the World Air Sports Federation (FAI), in particular when André Borschberg accomplished the pioneering first of flying five consecutive days and nights over the Pacific Ocean from Japan to Hawaii in the longest duration a solo airplane of any kind has ever flown and when Bertrand Piccard achieved the historic first crossing of the Atlantic Ocean in a solar airplane. For the two Swiss pioneers, it’s the accomplishment of a dream that was considered impossible by many experts and the demonstration that renewable energies and efficient technologies offer tangible solutions for sustainability. Bertrand Piccard, an explorer and medical doctor at heart, had the vision of an airplane of perpetual endurance after his non-stop round the world balloon flight in 1999, when he made the promise to circumnavigate the Earth again, but this time without any fuel. In 2004, he began bringing together the partners who provided funds and technology for this adventure and partnered with André Borschberg. An entrepreneur and skilled aviator, Borschberg took on the technical challenge of developing the solar airplane and making it fly. More than taking turns at the controls of Si2 in the air, the first ever Round-The-World Solar Flight is also a tandem achievement on the ground: while Piccard developed the project outreach to promote clean technologies, Borschberg pulled together the team that designed and constructed Si2 as well as organized the flight missions. “This is not only a first in the history of aviation; it’s before all a first in the history of energy. I’m sure that within 10 years we’ll see electric airplanes transporting 50 passengers on short to medium haul flights. But it’s not enough. The same clean technologies used on Solar Impulse could be implemented on the ground in our daily life to divide by two the CO2 emissions in a profitable way. Solar Impulse is only the beginning, now take it further,” said Initiator, Chairman and Pilot Bertrand Piccard addressing the crowd while exiting the cockpit of Si2. A few hours before touching down in Abu Dhabi, Bertrand Piccard spoke to UN Secretary-General Ban Ki-moon live from the Si2 cockpit: "Solar Impulse has flown more than 40,000km without fuel, but with an inexhaustible supply of energy and inspiration. This is a historic day for Captain Piccard and the Solar Impulse team, but it is also a historic day for humanity," said the UN Secretary-General. "You may be ending your around the world flight today, but the journey to a more sustainable world is just beginning. 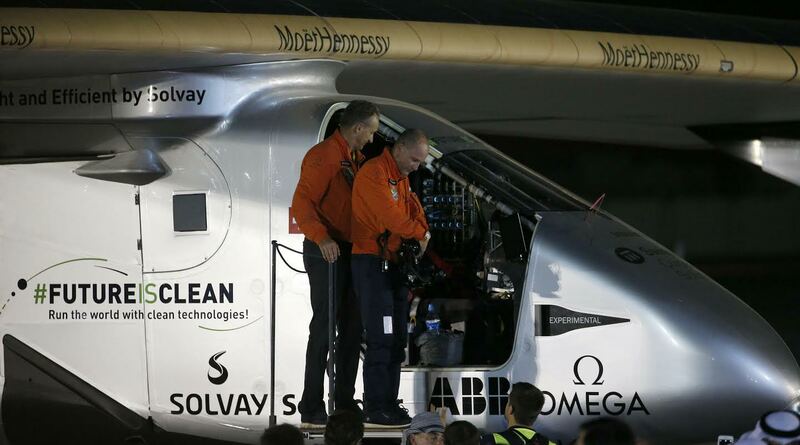 The Solar Impulse team is helping to pilot us to that future." Looking forward, Bertrand Piccard and André Borschberg will continue to actively promote the use of modern clean technologies as a way to improve the quality of life on Earth. Firstly, through the already announced creation of the International Committee for Clean Technologies that will build on the #futureisclean initiative and regroup the main global actors in the field of clean technologies to bring independent and credible guidance on energy policy to governments and corporations alike. Secondly, by carrying on the work initiated by the engineering team on unmanned and high endurance electric aircrafts, which could fly in high altitude for months, offering services that could provide exponential added value and complement the work being done by satellites today in a flexible and sustainable way. “We have flown 40,000kms (around the world) without fuel, but there is still a lot to be done to encourage a worldwide implementation of clean technologies and to motivate everyone to reduce their dependence on fossil fuels in their daily lives, hence the creation of the International Committee for Clean Technologies,” said Piccard. “Solar Impulse is of course very well positioned to contribute to the next generations of manned or unmanned electric aircrafts. By capitalizing on the engineering skills and expertise gained over the past decade, we will continue to work to encourage concrete innovations and disruptive solutions,” said Borschberg. 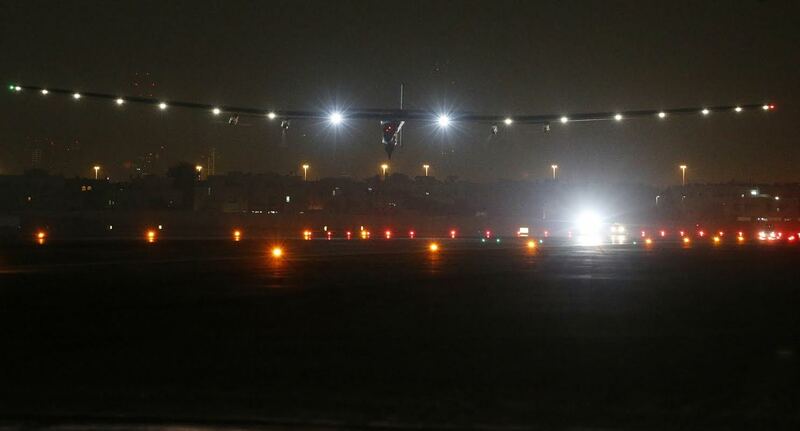 Solar Impulse 2, a four-engine battery-powered aircraft that relies on some 17,000 solar cells embedded in its wings, takes off on March 9, 2015, and lands 13 hours later in Muscat, Oman, with Swiss pilot Andre Borschberg in the cockpit. The other Swiss pilot and project director, Bertrand Piccard, takes over the next day and flies 1,465km in 15 hours and 20 minutes to Ahmedabad, India, where administrative delays ground the plane for a few days. The next two stages see Solar Impulse fly to Varanasi (Benares), India, and Mandalay, in Myanmar. Cold cockpit, long layover - On March 31, Piccard lands in Chongqing, southwestern China, after flying for 20 hours and a half. He has withstood temperatures in the unpressurised cockpit that fall to minus 20 Celsius (minus four Fahrenheit) as he reaches an altitude of more than 8,500 metres (28,000 feet). Bad weather keeps Si2 on the ground for more than a month, and Borschberg returns briefly to Switzerland for eye treatment. On April 21, the plane completes the sixth leg of its journey, reaching Nanjing in eastern China. It takes off on June 1 for Hawaii, but is re-routed to Nagoya, Japan, owing to bad weather conditions. Another delay of more than a month follows while repairs are made and a daunting cloud bank moves away. Borschberg makes history - On June 28, Borschberg heads east over the Pacific Ocean and makes a historic crossing that lasts five days and nights before he lands on July 3 in Hawaii. He has flown 8,924km in 117 hours and 52 minutes at an average speed of 61.19 km/hour, the longest uninterrupted journey in aviation history. Si2's batteries have overheated however and it sits on the island of Oahu for almost 10 months while repairs are made. Pacific crossing - On April 21, 2016, Piccard gets his chance to fly across the Pacific and lands almost 63 hours later at Moffett Airfield, south of San Francisco, after dusting the Golden Gate Bridge. Covering 4,086km, it is one of the most dangerous legs because there were few places to touch down if anything had gone wrong. The plane resumes its journey across the United States on May 2, stopping in Phoenix (Arizona), Tulsa (Oklahoma), Dayton (Ohio), Lehigh Valley (Pennsylvania) and JFK International Airport in New York after circling the Statue of Liberty in the middle of the night. 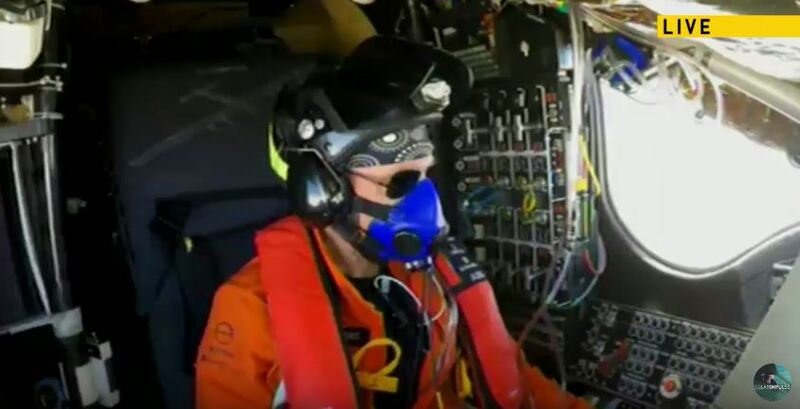 Borschberg is back at the controls when Si2 leaves Seville on July 11 for the penultimate leg across the Mediterranean to Cairo that covers 3,745 kilometres in a little under 51 hours. Piccard flies Si2 on the final leg from Cairo to Abu Dhabi, arriving July 26 in little more than 48 hours, after crossing the Red Sea and the vast Saudi desert. Another record - On June 20, Piccard leaves the US and makes the first Atlantic crossing by a solar-powered plane, reaching Seville, Spain, on the 23rd. The 15th stage covers 6,765 kilometres and lasts 71 hours and eight minutes.